American stage actor Hershey Felder brings hit show to London’s The Other Palace, celebrating the lifes of one of the world’s greatest composers. Hershey Felder Our Great Tchaikovsky plays at Andrew Lloyd Webber’s recently rebranded venue, which gives a platform to fresh work and little-performed musicals from across the globe. 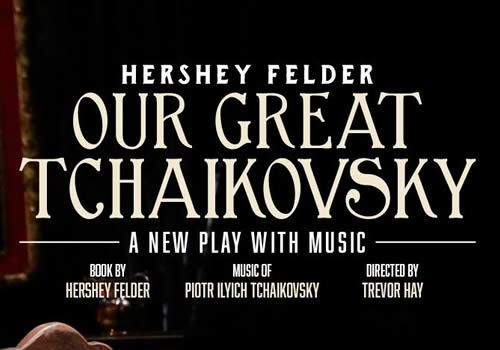 Delving into the backstory of the famous musician, Hershey Felder Our Great Tchaikovsky follows the highs and lows of the composer, as he faces musical challenges and difficult politics. Known for writing the beloved scores behind Sleeping Beauty, Swan Lake and The Nutcracker, as well as various symphonic works, piano concerti, chamber music and operas, Tchaikovsky is widely regarded as one of the world’s best composers. After conducting the highly anticipated Symphony No. 6, “Pathétique”, a healthy 53-year old Tchaikovsky was found dead. To this day, nobody knows why he died. An astounding tale of the enigmatic musician, Hershey Felder brings to life the songs and melodies that captured the hearts of the world. Hershey Felder is the stage performer best known for his shows about famous musicians, which are performed across America. Recently, he brought his show The Pianist of Willesden Lane to the St James Theatre. Further shows include George Gershwin Alone, Monsieur Chopin, Beethoven, As I Knew Him and Maestro: The Art of Leonard Bernstein, which can also be seen at The Other Palace. Fresh from a smash-hit US tour, he returns to the stage with his one of his most acclaimed shows. Hershey Felder Our Great Tchaikovsky plays limited performances at the London venue, from September 22nd to October 22nd 2017. Hershey Felder Our Great Tchaikovsky is suitable for those aged 12 and over.